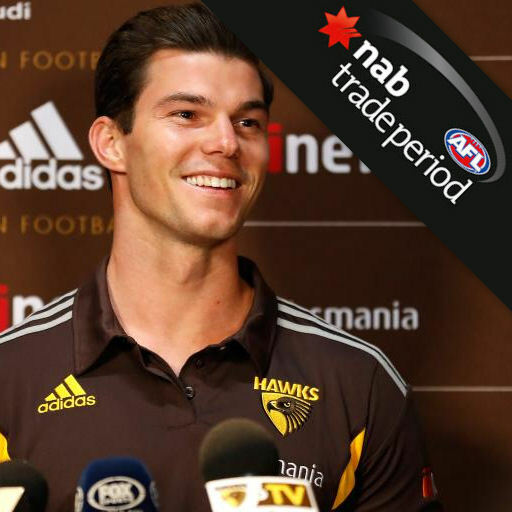 Check out Warnie’s take on every player traded in the 2016 NAB AFL Trade Period. Projected prices are based on an approximate magic number of 5660 (close to last year’s starting one) which also assumes that the $10M salary cap will stick as it has the last three seasons. Discounts have been applied following last year’s formula where appropriate. LATEST UPDATE: Thursday October 20, 6:50pm. FANTASY VERDICT: Heading to his third club, Stevens has been a solid Fantasy performer in the last two seasons averaging 83 and 85.7 however he has only played 12 games in each of the years. Stevens averaged 24 disposals, five marks, six tackles and 96 points in his six games in the VFL. The 25 year old may have played enough forward to add FWD status next season, but that is possibly line ball. As a forward, he’s worth considering, however, he may just be playing that at the Saints as they have an abundance of midfielders. WATCH IF DPP. "With Koby’s size, aggressive edge and ability to play forward we look forward to him making an impact as a Saint"
FANTASY VERDICT: Lids is a bloody jet, but he is almost untouchable in Fantasy these days. Sure he’ll probably still average in the 90s and be among the top scoring players (depending on his position – heat map looks very much like a wingman drifting back… possibly even a half-back flanker? ), but with 11, 17 and 18 games played in the last three seasons, can we trust his body? Deledio turns 30 in the first month of the season, although age itself doesn’t completely put me off him, it’s more about his injuries which seem to take much longer to recover from than the first diagnosis. I love him and he’s been a member of the Warne Dawgs plenty of times, but I will most likely avoid in Classic and will probably wait for a while in Elite. DRAFTABLE & PICKABLE, BUT BE CAUTIOUS. FANTASY VERDICT: It has been two years since Jaeger has played at AFL level and it has almost felt like it was that long getting this deal done. Anyway – in his two seasons, O’Meara has proven why we was taken in that GC mini-draft with averages of 89.1 and 92.7 playing all 44 games. Then the injuries struck. He missed all of 2015 and made a return late in 2016 to play NEAFL (three TOG managed games to average 16 disposals). O’Meara’s body should be right for round one, well let’s hope so anyway. There shouldn’t really be any reason not to pick him due to his price – assuming he is basically priced the same as what he was this year – and that he has a ‘full’ pre-season. WILL BE CHEAP IN CLASSIC & A DECENT LATER MID PICK IN ELITE. "I really want to earn the respect of my teammates. The best way to do that is to train hard." FANTASY VERDICT: In his time at he Giants, Palmer hasn’t been able to a) cement himself in the team or b) hit the Fantasy highs of his debut season for Fremantle where he averaged 87.5 from 20 games. It was always enjoyable to hear about how he was going in Magoos News every week on our podcast – he averaged 149 from his nine games in the NEAFL. Can we expect better than the 65 he’ll be priced at? Surely. Is he better than the pick 135 he was traded for? Yep. Should we consider for Fantasy 2017? Nope. NO CONFIDENCE IN PALMER ANYMORE. FANTASY VERDICT: SOS loves bringing in his ex-GWS lads. Marchbank might be useful for the Blues, but as a key defender, we will be passing on him in Fantasy land. This year he played the opening two games but hurt his ankle in the second and played three more NEAFL games before a shoulder injury ended his season. NO YOUNG KPPS FOR ME. 2016 AVERAGE: Yet to debut. FANTASY VERDICT: On the Giants list for two seasons without getting a game. Injured for most of this year (foot) and last year played NEAFL for 16 games to average 67 points. The 177cm forward won’t set the world on fire, but at basement price he has to be considered if he gets a chance. WATCHLIST. FANTASY VERDICT: There is definitely value in Williams. He averaged 76.1 two seasons ago from 20 games, but was in and out of the side this year – which was probably good for his future Fantasy stocks as he will be priced more than 20 points less than his best. Listening to some interviews, it sounds like the Roos may have a spot in the 22 for the former Pie, but he could play a bit deeper – oh and it is North Melbourne. I can see him increase his numbers next season, but I was one of many tricked by players at this price point in the backline this year. The real value of Williams’ inclusion will be for other defenders who may be freed up. WATCHLIST. FANTASY VERDICT: A discount for playing just four games will put him well under the 68 average that he posted between 2013-15 but that sort of average still won’t be enough to make him worthwhile for our Fantasy teams. Dunn managed to average 80 in the VFL this year… sorry, read the next review. DON’T BOTHER. FANTASY VERDICT: Did you know that Frost had his best ever Fantasy return this year, averaging 45.2? Is that enough to put you off even considering the key position defender? It should be. There is no chance he will ‘heat up’ despite moving to a warmer climate. PASS. FANTASY VERDICT: WHE could be an interesting option in 2017. With a very good chance of playing games at the Pies, the forward can provide us with some half decent scores and some cash in the early part of the season. Quad and hamstring injuries hurt his output this year, playing just two games (which should make him pretty cheap). In the NEAFL Hoskin-Elliott averaged 21 disposals and 93 Fantasy points from his 11 games, packing up from his 106 point per game output last year in Calvin’s favourite second level competition. With his best season being 20 games in 2014 for 67.8 points, regardless of what his discount it, with new opportunity he should be considered. WILL DEFINITELY MAKE CASH. FANTASY VERDICT: Failing to get a game this year, the former North Melbourne forward only averaged 66 Fantasy points from his 10 VFL games this season while battling an ankle injury in the second half of the year. Surely he’s purely depth for the Cats, but if he is looking like being able to string a few games together, then Black could make a few dollars for us. He did average 70.9 from 18 games back in 2013. UNLIKELY TO PLAY GAMES, BUT WILL MAKE CASH IF HE DOES. FANTASY VERDICT: We haven’t seen big stuff from Stewart in his four years for the Giants, averaging below 50 each season including 49.6 in 2015 when he managed 13 of his 18 career games which brought a high score of just 67. This year in the NEAFL the 196cm key forward averaged 77 Fantasy points. Stewart should be basement priced and could slot straight into the Essendon forward line, but don’t be surprised if he plays VFL to begin with. BENCH OPTION IF PLAYING. FANTASY VERDICT: I took Cloke as my last on field forward this year in Elite. I thought he would be a mid-70 average and do his job there. Well, he hit that average (just quietly, his best since 2013’s 92.5) but he was out of the side from round five through to 10, and missed a few more. A massive headache. Will Cloke be good for the Dogs? I think he will be an asset… just not in Fantasy. DON’T DO IT. FANTASY VERDICT: Brought in by the Eagles due to Nic Nat being out for the 2017 season. Vardy is surely some depth. Hopefully his body is fine – that has been the issue for him with a knee keeping him out for most of 2014 and 2015. This year he only got one game and his VFL games were less than impressive averaging just 56 points from 15 games… and still, he will probably only average around 60 or so meaning other investments would be more fruitful. NOT UNLESS HE IS A CHANCE TO BE SOLO RUCK. FANTASY VERDICT: The former Australian under 19 cricket captain was the surprise of the 2014 draft, taken at pick 23 by the Giants. The forward has played his two listed seasons in the NEAFL, averaging 74 points this year from his 18 games. McKenna’s usage seems to be an issue reading reports from his games in the reserves, but that obviously doesn’t matter for Fantasy – apart from getting a game and holding his spot. This is the issue. He will most likely play quite a few VFL games. BENCH OPTION IF HE GETS A CHANCE. FANTASY VERDICT: Lyons enjoyed a massive breakout year. He took is average from 44.6 to 89.3 – adding a massive $213K in value. We don’t usually consider players who have had such a massive jump in price/form in a single season, but Lyons has the chance to build on his awesome 2016. He may not hold DPP (close, but I’m leaning towards him losing it), but he could be a 90+ guy for the Suns with natural progression. Consistency was a major factor of his year, low score of 71 and a high of 109. Lyons was especially impressive following the bye round. We will be keeping a big eye on him in his new colours – let’s hope he retains FWD status. SEE HOW HE SLOTS IN THIS PE-SEASON. FANTASY VERDICT: This could be an interesting one. Caddy averaged a career high 21.3 disposals this year from his 16 games and has now posted back-to-back 85+ averages. There is half a chance he gains forward status, but I’m not banking on it. Only the two tons this season, in a higher scoring team at the Cats, doesn’t read too well… but it will all depend on how he fits in at the Tigers. He’ll improve, but will it be enough? NOT FOR ME AS A MID ONLY. FANTASY VERDICT: Tuohy is an interesting one. His Fantasy numbers have risen over the years, going from an average of 51.2 in 2014, up to 68.5 in 2015 and then 73.1 this season. He hasn’t missed a game in four years, in fact he has played 95 on the trot. To finish 2016, Tuohy averaged 89 in the last five rounds. Personally, I see some value here. The Cats have always had defenders knock up good scores out of the backline. Corey Enright’s retirement will mean there will be a few blokes in line to grab a few extra disposals (we are hoping our boy Jackson Thurlow is among the benefactors… and at a cheap price). Natural improvement should see Tuohy a draftable player and possibly one to have on your radar for an increase in average down back. ONE TO WATCH. FANTASY VERDICT: I’ve given Smedts a hefty discount above due to playing just one game this year… but it’s not really enough – to feel confident with him. New club, new opportunity, yada, yada, yada. He has been in and out of the side all of his career at the Cats, never stringing together more than a handful of games in a row – coupled with copping a red or green vest. Smedts has only scored over 80 three times, two of those were in his debut season where he played a career best 14 matches. He played eight games in the VFL for a Fantasy average of 88 (ave 23 disposals, five marks and four tackes) while battling shoulder and leg injuries. Smedts is still only 24 and while there is upside in him at that price (and what we’ve seen in the past), it’s going to be hard to pick him. UMMM… PROBABLY NOT. FANTASY VERDICT: Three years into the system, the 24-year-old joins Freo and you’d think he plays. 17 games and a Fantasy average of 62.1 was a career high for Kersten and while there can be some more improvement, he won’t average enough to warrant selection. I came up against him in Elite in a couple of leagues when he busted out scores like 105 vs Brisbane, 102 vs Gold Coast and 105 vs West Coast… and not the 30s, 40s and 50s that he is more about. CAN’T JUSTIFY IT. FANTASY VERDICT: It was a mixed year for Hrovat with ankle and shoulder injuries keeping him out of action for the majority. While he managed to play the last four senior home-and-away games which included a 94 vs Essendon, the injuries through the season restricted him to five VFL matches (average of 19 disposals, six marks and 83 Fantasy points) before the shoulder injury kept him out of the VFL finals. Hrovat’s second year (2014) saw him raise a few Fantasy eyebrows playing 12 matches at an average of 71.5 which included a couple of vests but also two scores of 110 or more. Is mid-70s where he’s at? No. He should be an 80+ average and with a discount due to only playing four games, he should be in the mix as an improving forward – a strategy many are likely to take if we loose a lot of our premium options when positions are announced. PRE-SEASON WATCHLIST. Welcome @nathanhrovat to Arden St! FANTASY VERDICT: Witts only played two games this year, so may possibly get a discount My projected price might be a little too low, depending on what they do at Fantasy HQ. If he is that cheap, then he is an option – even for bench cover because he is a chance to get games. That’s not a strategy that I will be rocking with, but if Witts ends up being used in Gold Coast’s ruck structure, then consider (especially if there are no other cheap ruck options). You would think that the Suns are heavily invested in Tom Nicholls as their main man, but who knows. Witts has scored four tons in his Fantasy career and produced his best season average in 2015 with 71.3 when there was a ruck merry-go-round with Grundy. PRE-SEASON WATCHLIST FOR SPOT IN 22. FANTASY VERDICT: Tassie boy Toby Nankervis has played 11 games over the last two seasons posting scores in the range we’d expect from ruckman early in his career, predominantly playing a supporting role. I’ve predicted a small discount due to playing six games this year. The question is, where does Nankervis sit for the Tigers in 2017? The 22-year-old could possibly be the number one ruck, being mindful that Ivan Maric re-signed and Shaun Hampson played 20 games this year. It’d be risky, but if we see 75-80+ scores then he is a viable option, however, over his career, he has only scored over 75 twice. I’m not sure that 2017 will see him in the mix as a ruckman worth considering in any format. Nankervis will need to be monitored over the pre-season, including NAB Challenge, to see if he should be on the radar. POSSIBLE LATE DRAFT OPTION OR IN CLASSIC USING A MID-PRICED RUCK STRATEGY. FANTASY VERDICT: Prestia has had six years in the system and it didn’t take him long to become a Fantasy jet. He averaged 63.4 and 74.8 in his first two seasons and then backed up with 96.6, 100.3, 95.1 and 92.9 from 2013-2016. Obviously there is the Gold Coast factor on all of this, but as a 24-year-old, Prestia has the Fantasy game – winning the ball on the inside and outside – to help him be a 100+ player again. That 2014 season where Prestia averaged 100.3, saw him play all 22 games scoring 11 tons and three scores of 130 or more. Unfortunately injury has held him back in the last couple of seasons, sitting out the last seven games of this year and only managing eight the year before. One to watch over the pre-season and hopefully he slots straight in. The bonus is that he will most likely avoid any tag with Dusty and Cotch ahead of him in the pecking order for attention. VALUE AND A GUN. FANTASY VERDICT: It’s a sad time here at Warne Dawgs HQ. As an Essendon man, I loved having Hibbo being one of the few Fantasy options in the red-and-back. A year out of the game and a trade to Melbourne should see my boy back at his best. In 2014 he averaged 89.3 from 18 games to make him one of the best defenders available for the year following on from the 87 average the previous year. I am assuming the banned Bombers won’t be getting a discount in 2017, so they will be priced on their 2015 average. The good news for those considering Hibbo as a high-80 type average is that he will be priced under 80. We will definitely need to watch the pre-season and hopefully get a read on how players will return from their year off, but I’m keen… even if that is a little biased. HIGH UP ON MY RADAR. FANTASY VERDICT: After biding his time at the Cats without getting a game, Hamling switched the the Dogs and managed 10 games (at an average of 46 Fantasy points) in 2015. This year he played eight home-and-away games and the finals with super-consistent Fantasy scores. A top score of 59 and a low of 37. Hamling isn’t going to be a Fantasy option. NOPE. FANTASY VERDICT: The Hawks have jumped the shark here in my opinion, but long term Clarko could look like a genius if they add another premiership cup to their trophy cabinet. Prior to this season, Lewis went 109.6 and 110.7 to make him one of the premier Fantasy players int he competition. This year he averaged a solid 103.2 playing all 22 games – which was a little bit of a shock with how the Hawks like to rest their stars. A slow start to the season saw him become a bargain – down to $474K – just before the byes. He went under 100 once from round 10 (and that was a 98). There’s always a bit of unknown at a new club and while Lewis is likely to still be in the top 20 or so midfield options, he will be turning 31 in the first month of the season and that is a turnoff if you are considering investing in him for Classic or going ‘too early’ on him in Elite. STILL IN THE MIX, BUT I’LL AVOID. DONE DEAL: Welcome to Melbourne, @JordanLewisO3! FANTASY VERDICT: Hanley’s 2016 average was his lowest since 2012, potentially make him a value option in 2017. Back in 2014, he posted a career high average of 98.5 from 20 games which included a couple of beast scores of 182 and 147. Hanley’s role has been an issue in his 129 games, sometimes playing as a half forward flanker and copping attention. Don’t expect him to have defender status… he is most likely to be available as a MID only. At the Suns, he should slot straight into the midfield due to their departures and numbers should improve. I think Hanley can post 100+ scores due to his natural game, but with a potential average in the 90s, is that enough to justify Classic selection? Even for Elite, he would go late in the draft however, I feel there might be better options around that 90 or so range – but, who knows, he could be a steal for someone. SOME VALUE, BUT RISKY. FANTASY VERDICT: Named as a FWD/MID, Ahern could be a bench option for our Fantasy teams in the future. He has been on GWS’s list for the last two seasons, playing 16 NEAFL games in 2015 averaging 23 disposals, four marks and 78 Fantasy points. As a junior, he average 88 points per 120 mins at the 2014 U18 Championships and 70 points in the TAC Cup. Ahern didn’t play at all this year due to back-to-back knee reconstructions, the most recent being in September which is expected to keep the seventh pick at the 2014 draft sidelined next season. INJURY TO HOLD HIM BACK IN 2017. FANTASY VERDICT: Apart from the discussion around Collingwood’s possibly non-existent backline, there isn’t any Fantasy relevance in the Nathan Brown free agent move to the Saints. Definitely positive for the Saints with some relevance of a couple of guys that may not have to play as tall, but Brown won’t be troubling the Fantasy scorers much in 2017. His average of 44.8 this year was the best of his eight year career. The 27-year-old hasn’t ever knocked up a ton. I don’t think I need to write anymore here. NO, JUST NO. FANTASY VERDICT: Here it is, the move of this trade period that I am going to call the most relevant. I don’t think any other move can beat this. Mitchell has been a Fantasy piglet for the last couple of years and Horse Longmire finds ways to frustrate coaches. Whether that is due to a run-with role or spending some time forward… even having a stint in the NEAFL. In his four years in the system, Mitchell has produced some epic numbers averaging 106.7 and 105.6 in the last two seasons, demonstrating a massive ceiling hitting 130 or more on 13 occasions. Huge. With Sam out, Tom will be an extractor in the guts for the Hawks and, at this stage, his role looks set for him to average 110+. Could he be in the mix as the top scoring player in 2017? I could keep writing, but I’ll leave it to our special Trade podcast next week. OINK OINK OINK. FANTASY VERDICT: We’ve got a live one here! Punters consuming trade content (like the awesome Trade Radio that I have been smashing out… way too much) didn’t see this coming when it was floated earlier this week. Sam Mitchell leaving the Hawks shortly after winning his fifth Best and Fairest as a four time premiership player – one as captain – to join the Eagles and play out a couple of years before becoming an assistant coach. Modern day trading. I love it. Anyway, Mitchell is obviously a Fantasy star and not a lot needs to be said about that. He’s averaged over 100 four times in his career with his best season coming in 2011 when he pumped our 112 points per game. As a 34 year old, Mitchell will be hard to consider as he is ‘getting on’, but seven scores of 120+ this year says that he’s still a good chance to deliver a triple figure return in 2017. Couple with that his history at Subiaco, where he will play every second week (104.7 average over his career – and most recent scores of 70, 117, 105, 109, 122, 100, 147, 141, 106, 82, 125… at the big ground), there’s plenty of reasons to think he’ll still pump out nice scores. The downside is the travel – which worries me. No doubt I would be taking him in Elite if he’s available around other MIDs at a 100 average. As for Classic, the pre-season will be telling as he offers some value priced just under 100 points per game, but it could be some of his team mates that might offer better bang for buck with a player of Mitchell’s ilk coming in. WILL BE A GUN AS AN EAGLE, MUST BE CONSIDERED. Welcome to West Coast, Sam Mitchell!! FANTASY VERDICT: Jack Steele is as relevant as they come. Playing as a FWD/MID (sure thing to hold that status in my opinion), he’ll slot straight into the Saints side, however they do have a very deep midfield and there will be plenty of blokes jockeying for position in the early part of 2017. That being said, Steele has the ability to average 80+… heck, possibly in the high 80s. We’ve spoken about losing a few premium forwards and Steele is potentially in the mix to be among the top 10 or so if all goes right for him. Maybe I’m getting a bit excited, but I’m all over him despite not registering a Fantasy ton in his 17 game career. Steele should have the opportunity to play 22 games in the red, white and black and will be a popular option in all forms of Fantasy. That is, if some coaches can forgive him for starting him in Classic and drafting him this year just to be let down with that 47 in round one and then being dropped for the next fortnight. HE’S IN FOR ME. FANTASY VERDICT: A win for the Dockers with Brad adding pace on the outside as he joins his brother out west, but not really for Fantasy. In his five seasons, 2015 was his best playing 20 games at an average of 74.9. As MID only, this isn’t in the mix to be draftable in Elite or a Classic option, even with a breakout. Hill has only cracked the Fantasy ton on six occasions in his 83 home-and-away game career. Great player, but you wouldn’t think that his numbers increase enough to be relevant at the Dockers. PASS. FANTASY VERDICT: It surprised me that Mayne was just 27 years of age – although he does turn 28 in November. There is still plenty of footy left in him and he should fit in well at the Pies. As for Fantasy, he has been a solid performer over the last few seasons of his career averaging 73.7, 86.5, 66.4, 80.3 and 77.2 over the last five years. Mayne has only missed five games in the last six seasons making him a durable player. We won’t be taking him in Classic, despite being ‘some’ value as he should pump out 80+ for the Magpies – depending on role. He could, however, be a steal in Elite if he does in fact have a career best year. Check out the NAB Challenge, but will be down fairly low on the watchlist. MAYBE WORTH A PUNT (VERY) LATE IN ELITE. FANTASY VERDICT: Sunshine was a buzz player for us back in 2015. He was basement priced and came out with some respectable scores in his first month of footy (74, 66, 62 and 98) and made a few dollars for us with a couple of 80+ scores a few weeks later. McCarthy won’t set the Fantasy world on fire in his career – especially following a year out of the game. The Dockers don’t kick big scores, ranking 16th for goals in 2016. The only hope of McCarthy being relevant in the upcoming season is if he receives a discount for not playing this year… eg. 30% would price him just below $200K and depending on what rookies we have coming through, would make him an option… but that could still be a stretch. ONLY AS A CASH COW IF PRICE IS RIGHT. FANTASY VERDICT: Turning 32 just before the NAB Challenge is set to kick off, Daniel Wells holds little fantasy value across the different formats in my opinion. He made plenty of coin this year – even when people sooked about him being ‘overpriced’ at the start of the year – to pump out his second best Fantasy average of his career. Firstly, the move to the Pies isn’t going to see him increase his average as he heads into the twilight years of his career (still can’t believe he has a three year deal!). In Classic, Wells will be ‘fully priced’. Too much to pay for someone from the get-go when there is little, if any, upside predicted. If we lose a crazy amount of forwards when Champion Data put out their 2017 positions, maybe he is in the mix IF he can produce similar numbers as he did at times this year (he scored six tons in his 18 games). In Elite, he should get drafted. I wouldn’t be taking him ahead of anyone that I believe will score in the 80-85 range as his durability is an issue, playing just 27 games in the last three seasons. LIMITED RELEVANCE. *** EDIT: As pointed out by Rob on Twitter, Wells is a huge change to be a MID only. FANTASY VERDICT: Wow. What a place to start. The Hawks are probably paying overs here for the man who has been a bit of a laughing stock (and whipping boy) for Tigers’ supporters during his eight year career. Watch now as the Hawks turn him into a superstar and make plenty of us eat our words. As for Fantasy, Vickery produced his worst season average since 2012 with 51.7 points per game. He has dropped a ‘consistent’ mid-60s average in the three years previous and also in 2011 where he played his only 22 game season. Upside, of course, but he’s worth mid-priced dollars and that’s what he’ll be worth come season end. Even if he has his first 70+ season, Ty Vickery isn’t even on the radar in Elite… unless you have a VERY deep draft. NOPE. Many forms of chromatography have been used over the years in the clinical laboratory for the separation and quantification of a variety of clinically relevant analytes. (iv)	the analysis of environmental samples. Chromatography is based on selective adsorption of compounds on a solid (or liquid) with high surface area (the stationary phase). As the solute mixture passes over the solid, the components are adsorbed and then released from the surface at differing rates. This means that the solutes are continuously partitioned between the adsorbent and the mobile phase, either a gas or a solvent mixture. The stronger the interaction of the solute with stationary phase, the slower the solute will progress. The motion of the solute and solvent through the stationary phase in called elution. Your task is to conduct research on the following topics and provide responses to the questions asked. 1. List substances that can be isolated using HPLC. High-Performance Liquid Chromatography is one method of chromatography. It uses a pump to pressurise a liquid solvent (mobile phase) through a column filled with absorbent material (stationary phase). HPLC has pharmaceutical use to purify bio-molecules such as proteins for pharmaceutical research, as well as legal use as it can identify doping agents and illicit drugs like amphetamine, cocaine, cannabis and LSD in human samples. 2. Are there any limitations or potential sources of error that need to be taken into account when this method of chromatography is used? HPLC is very great for analysing analytes in most cases, but it lacks a universal indicator and is very difficult for regulatory testing and beginners. 3. Choose one substance and outline how the process works in the analysis of this substances. E.g you may choose analysis of Vitamin D, immunosuppressant drugs after transplantation or lipid profiles. 1. List some of the compounds that can be analysed using TLC. Thin Layer Chromatography consists of a plate made of glass, metal or rigid plastic coated in an adsorbent material like silica gel (stationary phase) and a solvent (mobile phase) draws the analyte up the plate via capillary action. TLC can be used to analyse ceramides and fatty acids, detection of pesticides or insecticides in food and water, analysing the dye composition of fibres in forensics, or identification of medicinal plants and their constituents. Although it is a very simple and convenient technique, one of its limitations is that it cannot tell the difference between enantiomers and some isomers. Another limitation of TLC is that in order to identify specific compounds, the Rf values for the compounds of interest must be known beforehand. 3. Explain how TLC can be used to identify Aspirin in over the counter analgesics. 1. How is this method used in the analysis of blood alcohol levels? 2. Results from this analysis may be presented in a court of law. What precautions need to be considered to ensure accuracy? Sound like he’ll be MID only. Looks like Deledio doesn’t really care who he goes to, as long as he gets out of Richmond. Little annoying about Tuohy going to the cats, as he may take some of the cheap possies Jacko would pick up, though Jacko is still a lock if the knee is all good. Suppose Jimmy and Enright retiring helps him out though. I really dont get how O’Meara’s project price is 415k – i know that fantasy is very keen on putting a tax on certain players. but the fact is he hasnt played for 2 years – he really should be at most 350k. I projected it to be that price based on this year’s price. Whether it is Fantasy or other games, they don’t get an extra discount for an extra whole year out of the comp (ie. their price will be based on last year’s – magic number pending). In saying that, I don’t know if there will be a different philosophy going into 2017. Time will tell. But priced at under 80 is still pretty cheap! Warney do you think Lids has done enough to get back status straight up? Nah, I don’t think so. His heatmap shows a wingman pushing back. Richmond players all have maps that show pushing further up the ground. I wouldn’t even write off him being FWD/MID still. If I was guessing, it would be MID only. Great stuff Warnie. A few of these guys are very high on my watchlist, JOM, Titchell, Steele and Tuohy especially. Keep up the good work Warnie.